I accidentally slept in my contacts this weekend and have had some eye soreness/light sensitivity since. My eyes are improving, but I’m heading to the eye doctor later this afternoon. Those that know me know that I’m not one to frequent doctor’s very often. So, although I’m a senior about to graduate, this was my first time interacting with Duke’s online health portal and wow is it impressive. 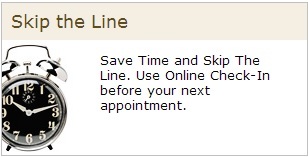 After I called and set up an appointment, I received an email directing me to the site to check-in for that appointment. I signed into my account (which I had made freshman year as required by Duke – took a bit of time to remember my password/username combo) and went through the process. First, I checked all my insurance information, then personal information and finally paid the co-pay. Afterwards, it gave me a PDF file containing the appointment itinerary and confirmation that I had already checked-in. Even more impressive, in the top right corner is a bar code that I’ll scan when I enter the Eye Center and it will automatically notify the Center that I’ve arrived. How cool is that?! It saves so much time, resources and limits mistakes. Given my distaste for doctor’s offices, I’m not sure how long Duke has had the system. The PDF does state, “[s]ome of our clinics have Arrival Kiosks and we will be adding more in the coming months. If your clinic does not yet have an Arrival Kiosk, use the Express Arrival lane at the clinic’s front desk.” So, maybe I’m getting all excited and the Eye Center won’t have an Arrival Kiosk yet. But, still, this is clearly the future. Even if I didn’t use online check-in, I can imagine a system where I walk into the office, confirm my information and pay on a touch screen and that signs me in. Quick and easy, like self check-in at airports. In addition, the Duke health portal has all of my past medical history and is incredibly easy to navigate. I’m guessing that Duke is pretty advanced in switching to an electronic system, but this is nevertheless impressive and a happy reminder that technology can simplify our lives in incredibly useful ways.